To Sin means to "miss the mark." The Enneagram comes out of a spiritual direction tradition so it speaks the language of sin. The teaching is that each type has its characteristic sin which disrupts the journey toward wholeness. In Christianity the Greek word most often translated as sin in the New Testament is a term that comes from archery. This Greek word means "to miss the mark." So, sin is that which makes you miss the mark in life. The "mark" is psychological and spiritual wholeness. Sin is that which derails us in life. It cause us to get off track and miss the goal. Each type has a specific sin. In Christianity there are seven "Cardinal Sins" but there are nine personality types. The Enneagram appears to add the two new sins of Deceit and Fear. These sins come from the Eastern religious tradition but are present in the Christian tradition as well. If you do not like the word "sin" then use the word "passion." It is these nine passions or sins that rule the personality types and must be brought under control through the consciousness of confrontation and acceptance. The sin of the Helper, Type Two, is pride. The Two who is always meeting the needs of others lives in a denial of their own neediness. Helper are proud of not needing anything. They are also proud of being such giving and self-sacrificing people. Such pride makes them inaccessible and gets them off track. Eventually, pride must be acknowledged and given up. 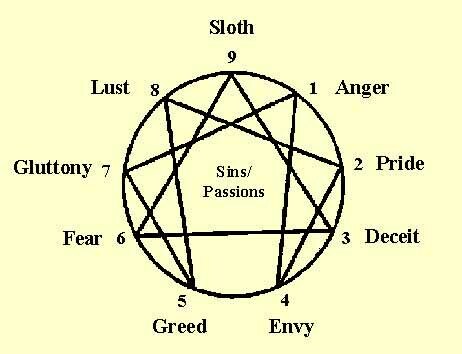 The Enneagram of Sin confronts each of us with those aspects of our type that we must confront and integrate.